Everyone knows that eating more fruits and vegetables is good for you, linked to everything from a longer life to lower rates of heart disease, cancer and obesity. Then there’s the good news that the nutrients found in produce are the vitamins and minerals that do so much good for all of our body’s systems from skin health ( vitamin A, vitamin C ) to brain health (folic acid and other B vitamins). -Only 1 in 10 Americans eat enough fruits and vegetables each day for good health. ( Centers for Disease Control and Prevention, November 2017) Come on people! We can do this! One more serving folks. Want something new? Introducing Caulilini! This just in! 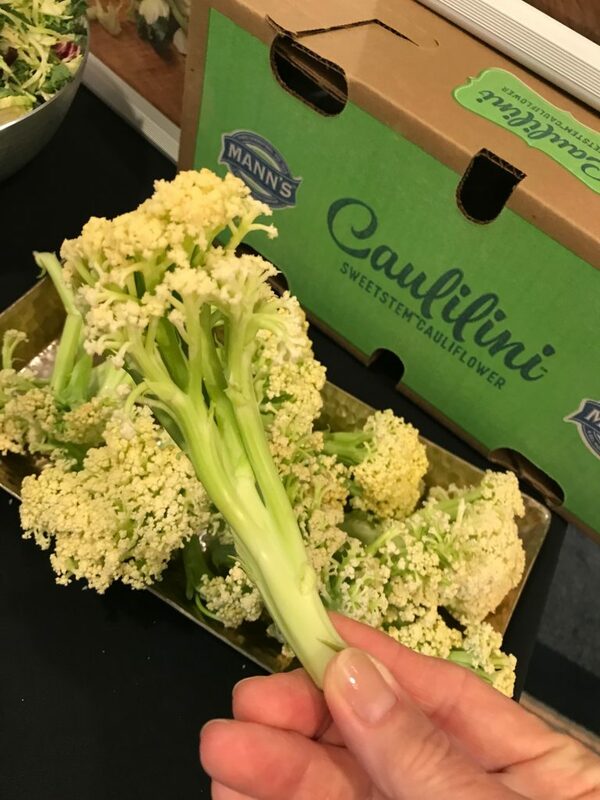 Caulilini by Mann’s, the produce company that gave us broccoli slaw made with the stems of broccoli. Just shows you how much fun it is keeping up with the delicious new ways to eat more produce! But, then there’s the but…what about the risk of pesticide residue on produce? What about the recalls and even outbreaks of illness associated with bad bacteria on produce? What’s going on in the farms and the fields? Well, I have always believed that “the more you know, the more you can eat” and I wanted to learn more about produce safety myself. But rather than reading yet another headline or digging into a federal document ( yum! ) I wanted to go to the farms. Who doesn’t love a celery selfie? Why talk to the farmers? 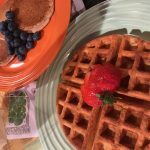 I knew that the fears people may have about eating produce might get in the way of them eating fruits and veggies so I wanted to do something to calm those fears by seeking the facts. Check this out! These fears are fighting the “eat your vegetables” mission! No bueno. 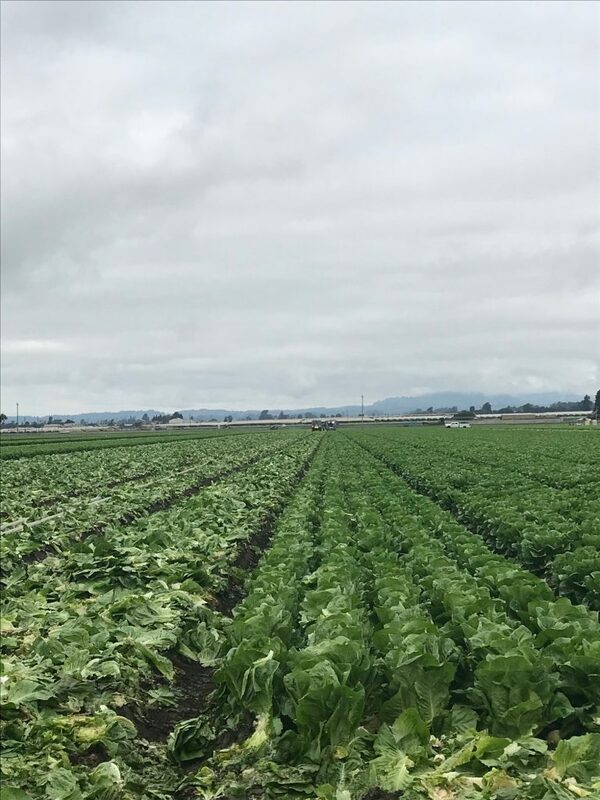 So, I decided to accept an invitation from The Alliance for Food and Farming to visit the Salinas Valley of Northern California to see for myself and talk to the folks who work on produce farms. Visit their Facebook page to get to know them by clicking here. My first impression: they are proud! Please take note of our “accessories” in the field! Hairnets and beard nets required to keep our hair out of the harvest, because there are strict sanitation rules. 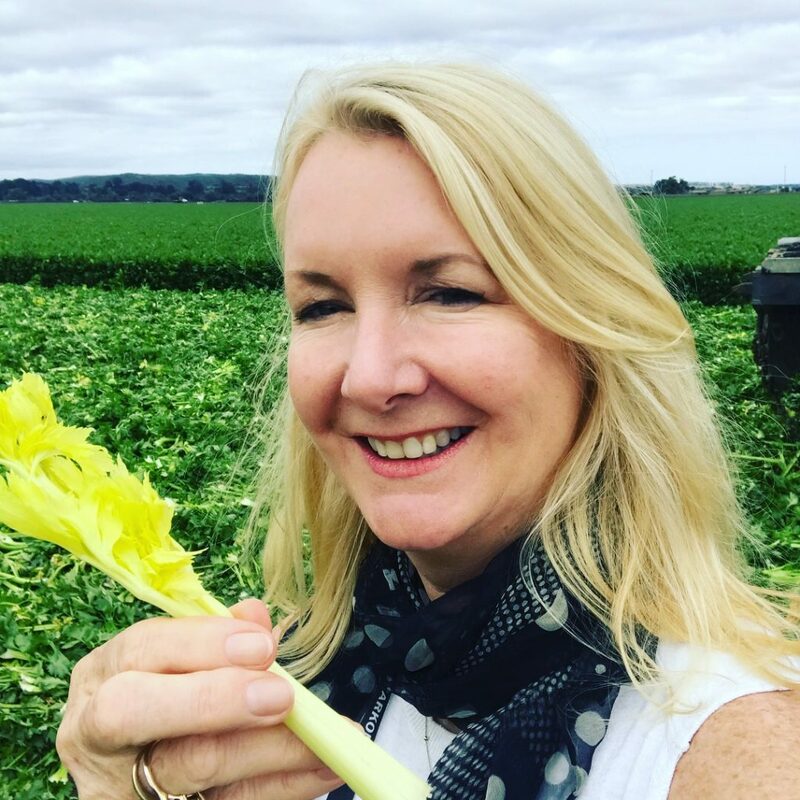 The refreshing scent of freshly harvested celery at Ocean Mist Farms was aromatherapy and made me wonder what new ways can I cook with celery, one of the least expensive veggies in the produce section and certainly one of the lowest in calories! When in Paris I enjoyed braised celery as a warm side dish at La Reserve Hotel’s restaurant Le Gabriel and it was a game changer. Celery soaks up flavors. This farm tour group included a large gathering of food service professionals many of them working in the produce industry and a small group of my registered dietitian nutritionist colleagues. 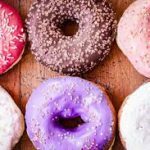 I’ve know many of these RD’s for years and we share the smart philosophy of listening to the experts and learning about all kinds of food and nutrition topics, especially the ones with the most burning questions from everyone who cares about what they eat. Hey we clean up pretty good! 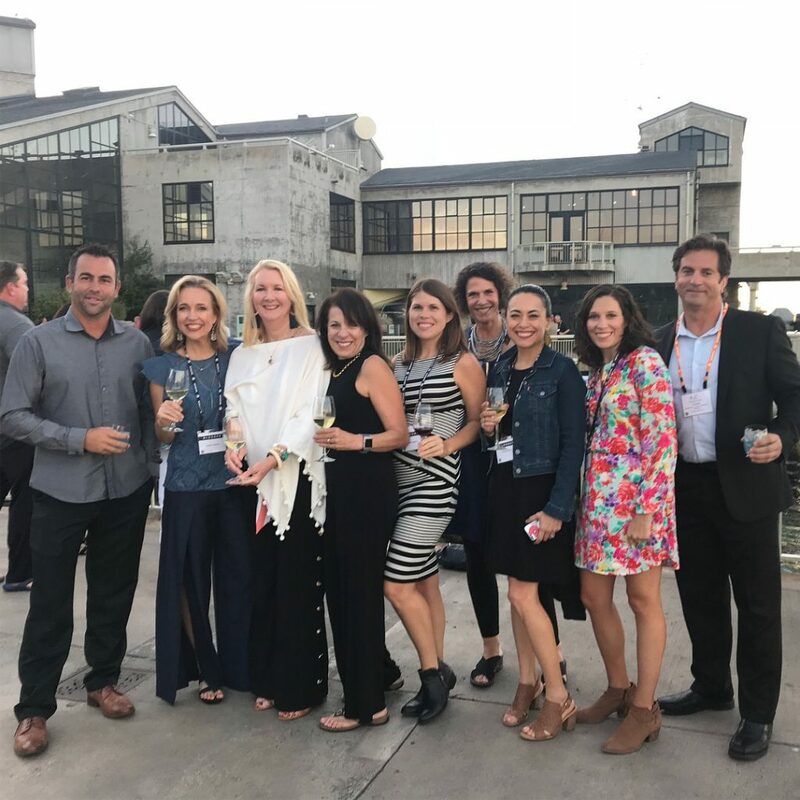 Dinner at the Monterrey Bay Aquarium with my dietitian pals after a day of touring the farms of the Salinas Valley. Wine is agriculture too, ya know! 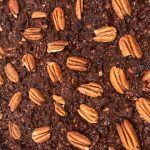 Produce safety is certainly one of those hot topics we need to keep up on to share the best information with our readers, our viewers, our nutrition clients and our family and friends. So, what’s being done to keep our produce clean? Well, I can tell you this- a lot of hand washing and in the fields! 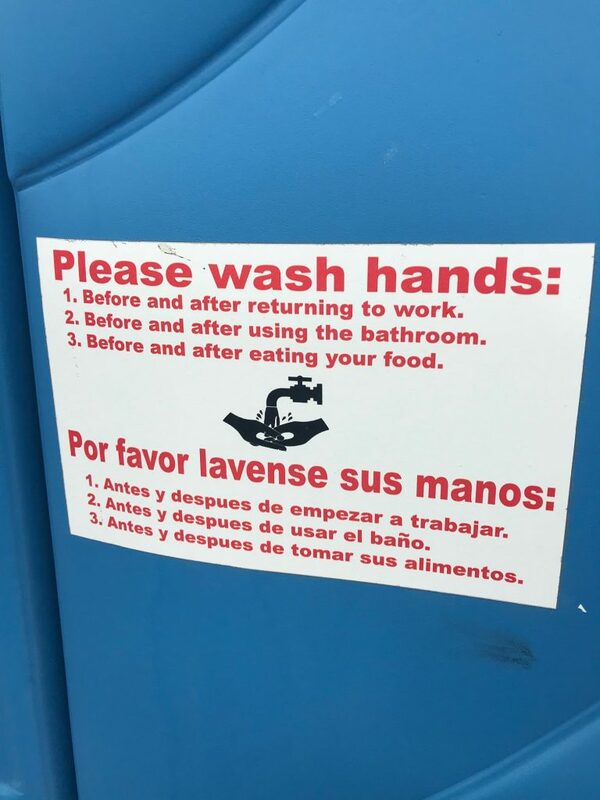 Produce companies are diligent about training farm workers and visitors to the fields that they must wash their hands and respect the integrity of the fresh crops bound for supermarkets and our kitchens or restaurant kitchens. Soap and water is the one of the most basic front line defensives against the spread of bacterial contamination. And as you can see in the photos, porto-johnnys, are readily available. 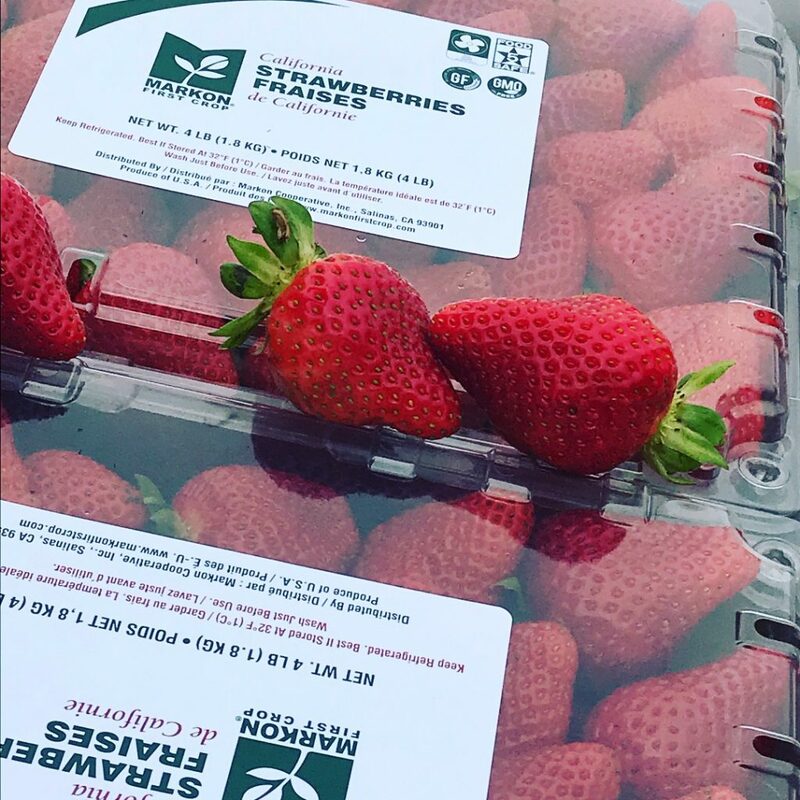 Next sweet stop: strawberry fields forever with California Giant Berry Farms where just picked berries are carefully packaged on the spot. They’ve got some cool videos on their Facebook page, click link in the name. 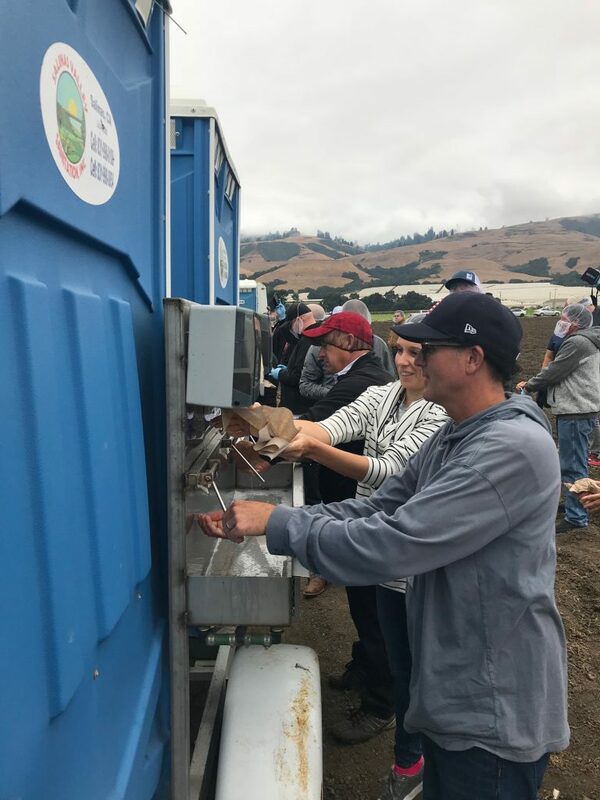 Sanitation and food safety measures continue from farm to fork with good agricultural practices, good manufacturing practices and monitoring systems throughout the transportation process. The next time you pass a big truck on the highway, and it may be carrying fresh vegetables to market, know that the best practices for food safety include temperature monitoring. 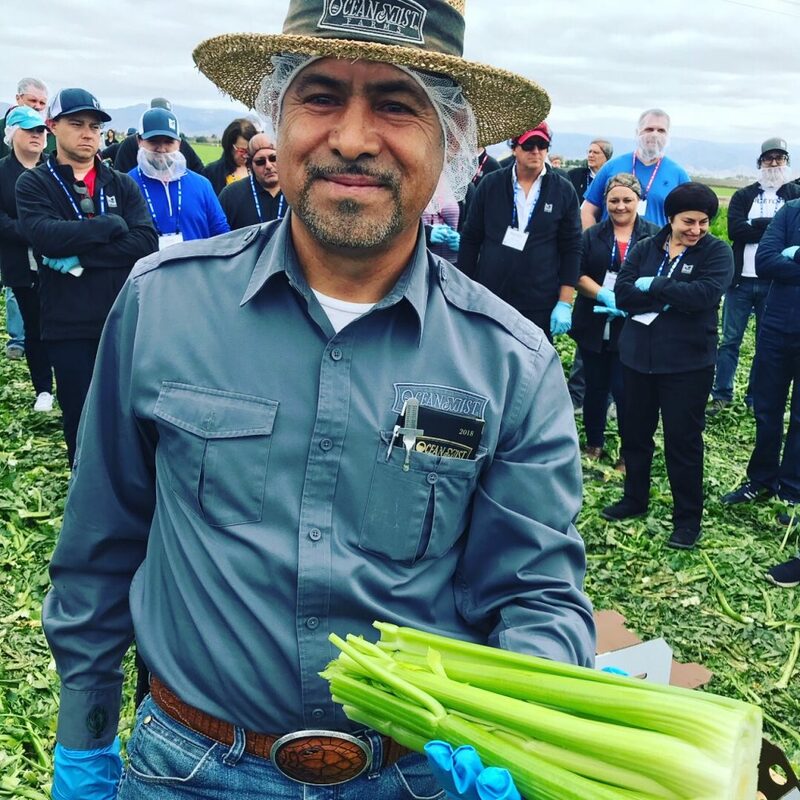 Companies such as Markon ensure a 5-Star Food Safety Program from grower-shippers with full trace back to the field on every item. If the shipment of lettuce, let’s say, gets too warm it’s not acceptable! Warm temps can increase bacterial growth and up the risk for food borne illness. 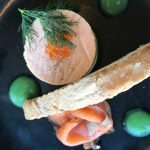 Markon’s serious approach to food safety promises “confidence in every case”. 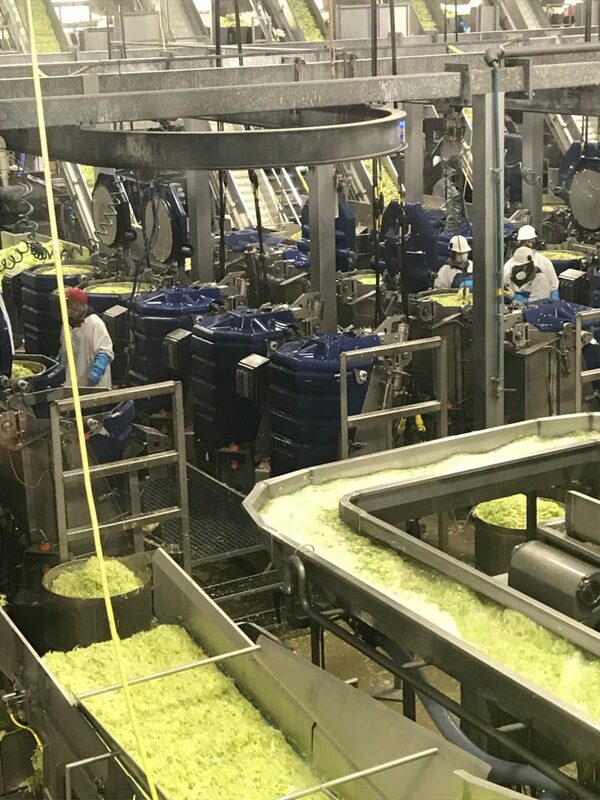 Food safety measure really ramp up in facilities that package produce, such as Taylor Farms which is the world’s largest processor of fresh cut vegetables!! See those big navy blue canisters? Those are giant salad spinners to shake off the excess water used in washing lettuces. 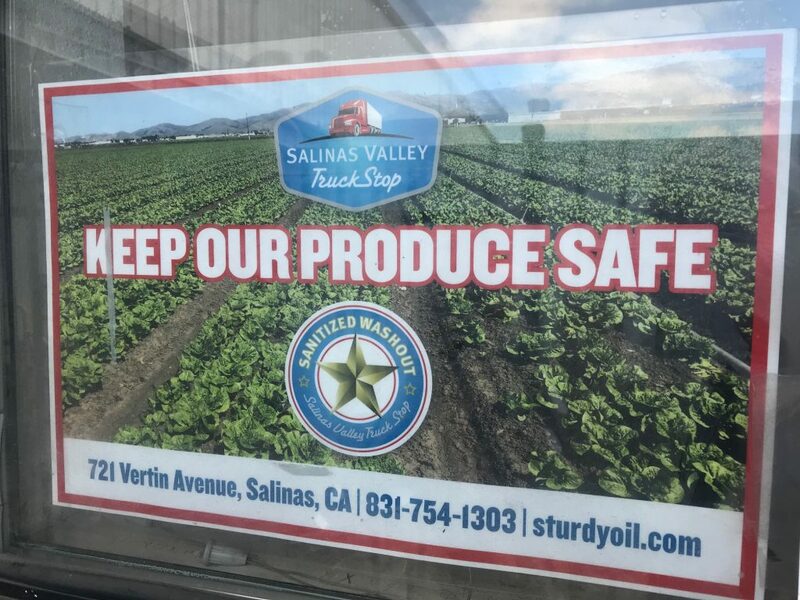 Produce safety is part of the landscape in the Salinas Valley with signs like this one. Full Disclosure: My travel to the farms and produce facilities of Northern California was sponsored by the Alliance for Food and Farming. Their website is a bountiful harvest of science based information on produce safety. www.safefruitsandveggies.com I received a small honorarium for my time documenting the farm tour as well. What about Pesticide Residue? Bottom line: I wouldn’t worry about it. I’d worry about eating enough vegetables for good health! The benefits far outweigh any risk. CROP PROTECTION when done right protects us too. I listened and learned a lot about pest management and that includes the farming challenges of using products to help control damaging insects (insecticides), weeds (herbicides) and microbes such as fungus (fungicides) that may affect the health of the soil and therefore the plants. Even in organic farming there’s a list of approved pesticides. So the process of organically growing produce is not ‘pesticide free’. 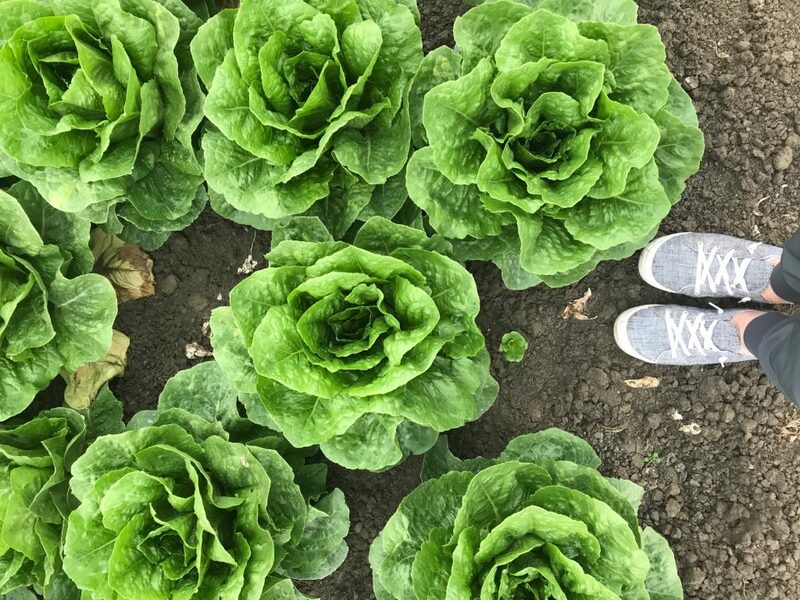 What we’re striving for in conventionally grown and organically grown produce (often the same farmer uses both techniques depending on the crop) is an end product that arrives on our plates that contains NO pesticide residue. Treating crops with these pest control products can be expensive so farmers do not use them willy-nilly. 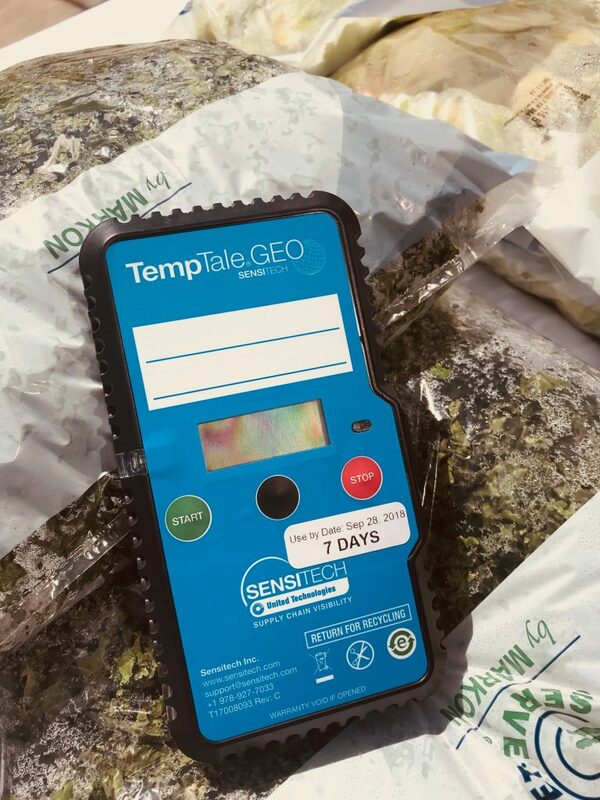 When used at the right time, in the right amount, according to super specific application directions- pesticides can fight the bad things that might take down an entire crop and leave no trace, no residue in the fruits or vegetables by the time they’re ready for harvest. That’s why the field of ‘pesticide management’ today is called crop protection. Sometimes crop protection enlists bugs to fight other bugs. Ladybugs and other beneficial insects are released into fields of strawberries for instance to battle the bad bugs that may destroy the budding berries. 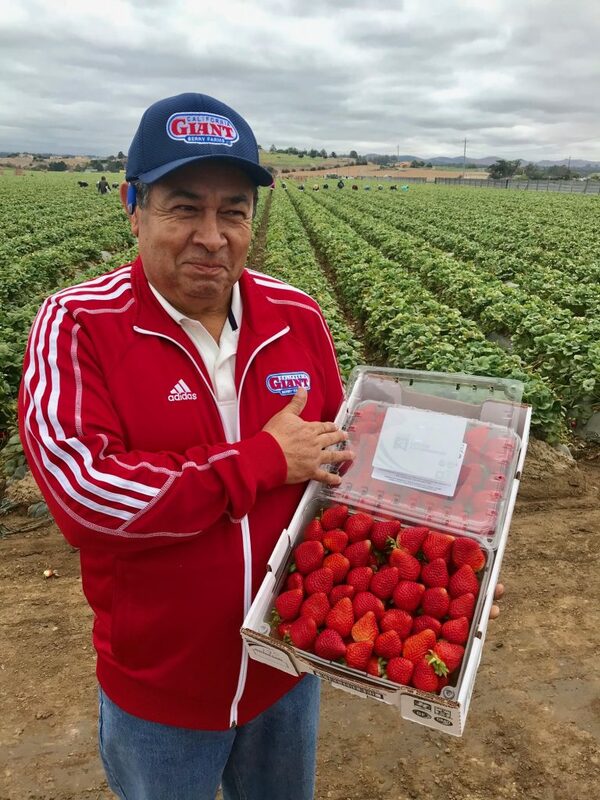 There’s lots of good information on integrated pest management on the website of the California Strawberry Commission. In fact, I’m really impressed with the depth and breadth of research and resources on this website. 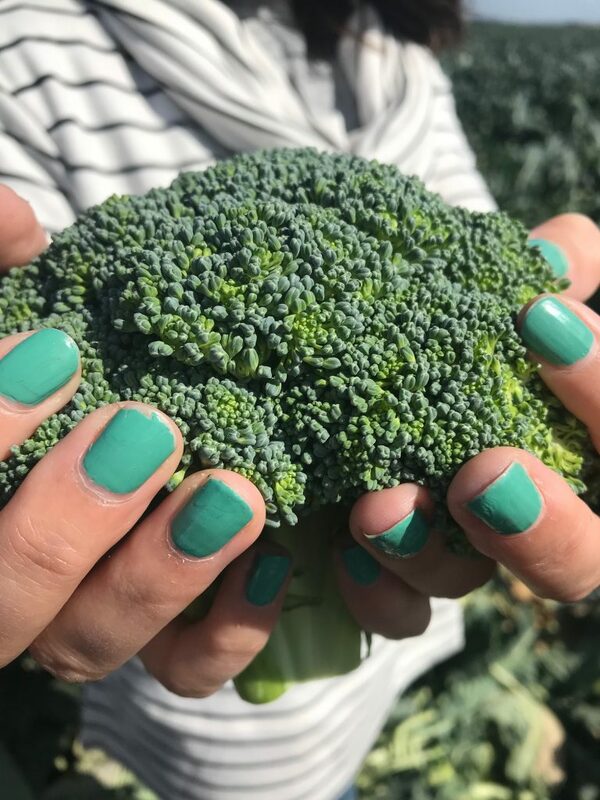 Broccoli is ready for its close up. Look Ma! No pesticide residue! Farmers want you to ask questions and they’re more than ready to answer them. 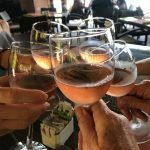 Cheers to the Alliance for Food and Farming for championing produce safety and sharing science based content so you can feel good about feeding your family and friends the nutritious and delicious bounty of fresh fruits and vegetables grown on US farms today. 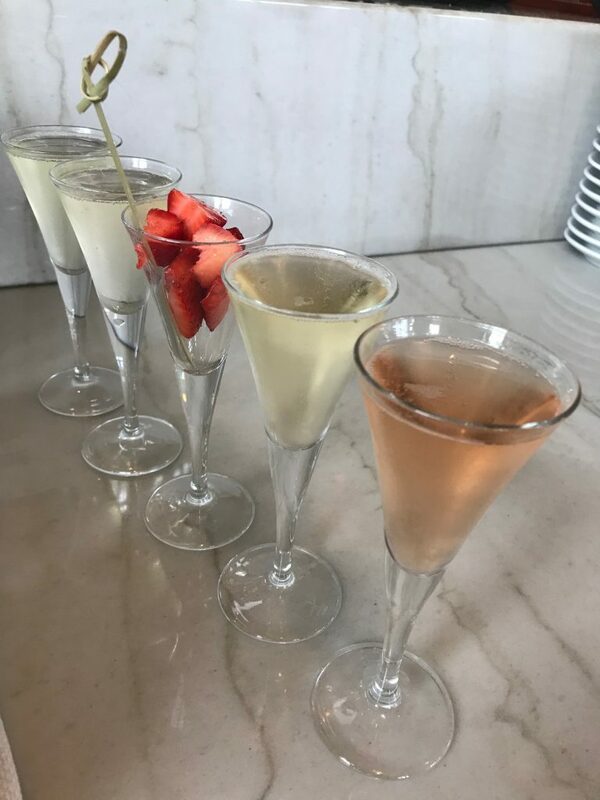 California strawberries add bright sweet note a flight of California sparkling wines! Oh, and a little vitamin C! Thank you again to The Alliance for Food and Farming. I can’t wait to learn even more and will keep up with all of the news from the AFF. And thank you to Markon ( love your 5-star Food Safety Program! ), California Strawberry Commission, Taylor Farms, Ocean Mist, Mann’s and Giant Berry Farms. Toss all that together and we can make a pretty darn delicious salad!